Microbial communities provide useful information about environmental change. Microorganisms are present in virtually all environments and are typically the first organisms to react to chemical and physical changes in the environment. Changes in microbial communities are often a precursor to changes in the health and viability of the environment as a whole. Created in accord with recommendations of microbial ecologists specifically for community analysis and microbial ecological studies. Biolog EcoPlates have been found to provide a sensitive and reliable index of environmental change. This approach, called community-level physiological profiling, has been demonstrated to be effective at distinguished spatial and temporal changes in microbial communities. 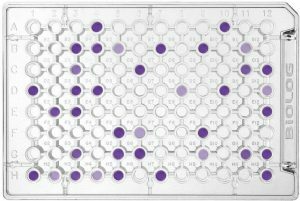 In applied ecological research, the MicroPlates are used as both an assay of the stability of a normal population and to detect and assess changes following the onset of an environmental variable. The utility of the information has been documented in over 500 publications using Biolog technology to analyze microbial communities. Visit our bibliography.